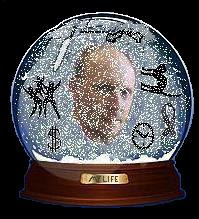 I think we all have, at one time or another, picked up a snow globe & given it a good shake! Up flies all the white stuff as snow or glitter for a starry sky. The scene below sits frozen in time as the flakes swirl around them. Depending on the strength of the shake or the whirl of the wrist, those pieces spin & drift until finally settling into their resting places. Then....we shake again! Watching the same scenario repeat...again & again & again. Lately, life seems to be resembling these such...snow...globes. Here we are in the middle of a warm scene from our life. Looking around....things seem...normal (or whatever that word is supposed to mean) but it all looks to be in place. Everything is going along nicely. No reason for alarm or concern. Our peaceful utopia is thrown into complete chaos! The ground all of the sudden starts shaking & quaking. We're rocked from side to side vigorously as a dizzying spin sets in. Everything around us is now in a frenzied whirling...pelting us over & over & over & over & over again. Raking our skin...tearing at our sensitive selves. We try to move but find we are glued to the floor. No matter how hard we pull & tug...we're not going anywhere...we're stuck! So we pray for help or swear to the heavens...either way...the only way through it....is to weather out the storm. Things start to settle down. The blasting elements...slowing down. Calmer waters come & we brush off the debris & cover up the wounds. Breathe a deep sigh of relief that we made it through that terrible time. We see things start to fall back into place & are happy being back to that obligatory "normal" once again. Our peaceful utopia is thrown into complete chaos all over again! The ground shakes & quakes. We're rocked from side to side vigorously as a dizzying spin sets in. Another frenzied whirling of sharp & painful objects fills the sky. Belting us over & over & over & over & over again. Ripping at bruised hearts...tearing at our sacred souls. Again being unable to run or hide or even duck. So we pray for forgiveness or swear off altogether...either way...the only way through it....is to weather out the storm...again. Once again things start to settle down & those damaging elements...no more then a soft falling leaf. Calmer waters come & we shake the debris off & do our best to hide the scars. Taking more deep breaths & praise that yet again we made it through. We see things getting back into place & are happy being able to return to "normal" once again.